Does Your Baby Have Great Motor Skills and Head Control? If you answered No, an activity center might not be a great idea to use just yet. Babies generally are ready for an activity center when they reach 6 months but some are ready in 4 months. The last thing I want is to give advice that would cause harm. Always check the manufacturer’s safety guide or babies pediatrician if you are unsure, below is our list of the best baby activity center on the market. What makes this the best baby activity center? Skip Hop Explore and More Baby’s View 3-Stage Activity Center is one of the best products designed for 4 months and older. The product features a 3 stage system that swivels, sits, bounces, interacts and comes apart as a play table for when your baby can stand on his own. Your baby can rotate 360 degrees while bouncing and interact with the various activities this saucer comes with. The foot support is adjustable which is great as the product is generally not recommended for babies that can’t yet support themselves, as they grow you can adjust for the perfect height. The legs of the baby activity center detach easily for easy storage. This is a well-made product, sturdy and can take the beating your baby will throw at it throughout the coming months. Watch as your baby giggles and go nuts in this activity center. We love these best baby activity centers and you’ll love the product too. Skip Hop Explore did an amazing job designing this unit. It’s fairly easy to set up and once you are ready to use, you’ll probably put the baby activity center in your most active room. You’ll love that it’s not a tremendous contraption and the toys keep your baby occupied for those quiet times. This activity center will keep your baby busy when you really need it. The quirky little toys are really well thought out when making this activity center and your baby will love playing with them and rotate around. If you find that they are becoming too accustomed through the toys and are no longer engaged, the toys are really easy to move around and you can add an extra toy. This activity center comes with a large bowl that attaches via suction cups which is great for baby snacks. The Skip Hop Explore Baby Activity Center really is built for a 4-month-old baby and with its multi-purpose design will last beyond your baby’s infant days. This unit does not take up much space which means you can easily hide the baby activity center away so the product does not become an eyesore around the house. Some parents complained about the price but this is one of the best baby activity center you can buy. This is one of the best baby activity centers on the market. The Evenflo Exersaucer Triple Fun Activity Learning Center has a lot of features that will keep your baby busy and entertained all day long. Also, the product features a beautiful and ergonomic design paired with many bright colors. The sturdy design of the activity center also tells you that you don’t need to worry about your baby’s safety. Also, it’s designed over serving the needs of a baby from birth up to 24 months. If you are wondering if this activity center is best for your newborn baby, you’ll be glad knowing that the product can be safely used on mats thus making it a great choice for babies that can’t sit yet. Another good thing about this activity center is that you can use it for your baby even when he is older than 24 months by turning the product into a comfortable play table. As the name implies, this baby activity center ships with an amazing three-position adjustment for the height. This is great since it will allow you to adjust the activity center which fits the growing body of your baby. The toys are fun when your baby plays with them and they will go a long way in enhancing the development of your baby. The product is foldable thus making it easy to store and move from place to place. Furthermore, the detachable seat pad is machine washable which invariably means cleaning will be easy. This activity center’s spin, rock, and bounce features are useful in helping your baby get all the exercise he may need to strengthen his spine, neck, and legs. However, some users complained that the assembly of the product is somewhat hard. Also, the toy bar and learning pods of the activity center require 9 AAA batteries but these are not included but you may purchase them separately. We belive you would love this center and we consider it one of the best baby activity center on the market. The Baby Diego Cub’zone Playpen and Activity Center is another amazing, best quality product on the market. The playpen is designed for babies aged 6 – 24 months and it can be used both indoors and outdoors. Also, the product is best if you are looking for something that can be used at work. The baby activity center is also great if you are a work-from-home mom as you can work peacefully while also watching your baby as he plays. This baby activity center securely holds your little one in place and it may be difficult for him/her to get out without seeking your help thereby ensuring that he doesn’t crawl away someplace else. The product features a sturdy design made of plastic. The Baby Diego activity center’s beautiful and multicolored design will go a long way in adding style to your baby’s nursery. Furthermore, the assembly is a breeze with the baby activity center as you do not require any special tool for the completion of the process. It has a dimension of 31 x 13 x 24 inches which invariably means the activity center is large enough for your baby to get all the fun he may desire or even play with friends and siblings. Interestingly, you can reduce or increase the size of the playpen by either adding or removing a panel. You can purchase more than one and pair them for a bigger playpen or for multiple babies. Also, this activity center weighs about 34 pounds, making movement from place to place an effortless endeavor. Storage may also not be a problem with this product. The product has a minimum weight recommendation of about 5 pounds and a maximum recommendation of 40 pounds. In addition, the product sports ball spinners, picture house, play telephone, as well as a swinging hinged gate coupled with a safety lock which further ensures the safety of your baby while using this activity center. The product can be easily cleaned and maintained. The baby activity center is more expensive than similar playpens on the market, but looking at the features of Baby Diego Cub’zone Playpen and Activity Center, you will agree with me that the product offers good value for money. Also, for your baby to be comfortable, you should purchase a carpet separately since the activity center does not ship with one. The Baby Diego playpen is not recommended for newborns. The Oribel PortaPlay 4-in-1 activity center is one of the best and an amazing baby activity center designed in a way that caters to the need of your little one from birth to his/her toddler years. The product features an ergonomic and luxury design that provides your baby with fun and comfort that keeps him/her occupied all day long. Also, this activity center is ideal whether your baby is a boy or girl. Also, this activity center’s available in two designs – forest friends and combo and tow different color combination – green-white and grey. The baby activity center has a lot of fun features and the top among them is the convertible design. Yes, you can convert the baby activity center in a way that best serves the needs of a newborn or a toddler. Also, the product ships with amazing fun toys that will enhance the mental development of your baby significantly. This activity center features a complete play table that allows your baby to choose whether he wants to play, create or even draw. The baby activity center ships with a firm and elastic seat that efficiently support the weight of your little one while providing enough room for his comfort. Also, your baby may bounce up and down the product thereby providing an opportunity for maximum fun. The baby activity center features patented foldable legs and it has a dimension of about 27 x 27 x 18 inches which simply means that storage will probably not be an issue. This will also allow the product to effortlessly fit into the trunk of your car when traveling. The product weighs only 13.67 pounds thereby making movement from one place to another an easy task. Furthermore, the seat of this activity center also has a 360-degree function that allows your baby to easily explore the toys that shipped with it. The manufacturer of the activity center list art paper dispenser rolls and matching stools for sell but you should know that you may purchase these separately. Some users have complained that the product is too pricey compared with similar ones on the market. 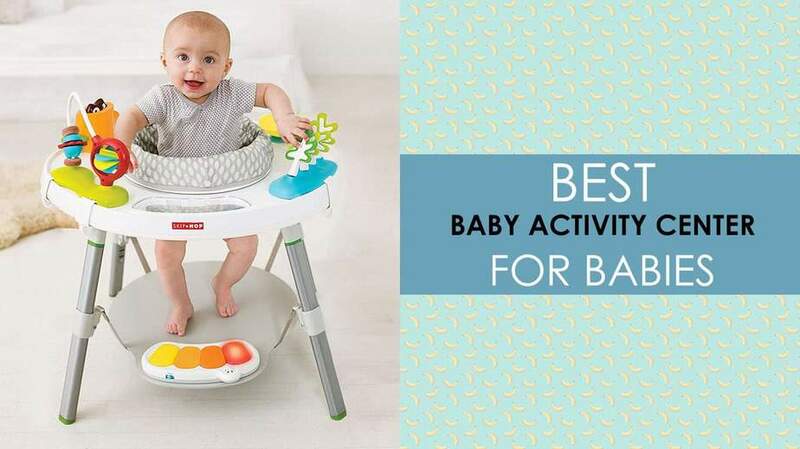 If you are looking for the best baby activity center, with amazing features for a budget-friendly price, then you should consider checking the Baby Einstein Rhythm of the Reef Activity Saucer out. It’s made from a sturdy plastic material that will support the longevity of the product for a long time. The beautiful bright colors of the baby activity center will enhance the style and color of your home decor. The product is ocean themed and it comes with toys of different spinning sea themed characters, leaf teether, piano station, other ocean creatures. Also, this activity center features music and sounds that are ocean themed. The product ships with more than 11 entertaining features that will keep your baby entertained as well as enhancing his/her mental development. This amazing baby activity center is one of the best and it is ideal whether your baby is a boy or a girl. Assembly of the product is easy and it is easy to collapse. The product may also be moved from place to place with ease since it only weighs about 13.2 pounds. Additionally, storage may be relatively easy as the baby activity center has a dimension of 28.5 x 9 x 28.5 inches. Furthermore, the Baby Einstein baby activity learning center features three different height positions that allow the adjustment of the product in a way that efficiently caters to the needs of your growing baby. The feature of this activity center allows you to enjoy the benefits of this activity center for a long period of time. Also, the product features detachable seat pads that support machine wash for easy maintenance. The seat of the activity center is designed in a way that rotates 360-degrees thereby making the toys easier for your baby to reach all the featured toys at will. This activity features of the product are available in three different languages including English, Spanish, and French. However, some users have complained that the height of the baby activity center may not be easily adjusted. Others state that the product is not stable. The Bright Starts Around We Go 3-in-1 an amazing baby activity you should consider looking at. It’s one of the best activity centers and made from a top quality and durable plastic that provide your baby with all the fun and comfort he may desire. Also, the product comes with a beautiful multi-color design and will go a long way that adds color to your nursery. This activity center is designed in a way that caters to the needs of babies which are aged 6 months or more. The maximum weight and height recommendation of this activity center is 25 pounds and 30 inches respectively. The product is ideal whether your baby is a boy or girl. Furthermore, this activity center is easy to use and all your baby needs to do is rotate the 360-degree functioning table to play with the toy of his choice. Your baby can move all he wants in the walker paired with this activity center which may serve as a form of exercise thus supporting the development of his spine and legs. The walker is securely attached to the table thereby reducing the risk of accidents. With this activity center, you can indulge in other activities yourself knowing your baby is safe. The product features more than 15 activities, all of which will go a long way in enhancing the mental development of your baby. The activities include but are not limited to a piano station, music, Ladybug roller drum with beads and textures, Lion popper with spinning beads, spinning toucan stalk, spinning sun and c-link for additional toys, 2 toy bars feature soft hanging leaves, a mirror for self-discovery, bead chaser and bendy leaf teether. The seating of this activity center features adjustable height positions which makes it easily adjustable to suit the need of your growing baby. It comes with teether toys and flip book. All these features of the activity center are offered at a range price. However, some user has complained about the plastic used in making this activity center is of a low quality. Some parent may also not feel comfortable leaving their baby in a walker. The product is not recommended for newborns. This is another best baby activity center on the market. The Delta Children Lil PlayStation 3-in-1 activity center is a top quality product designed to comfort and entertain your baby. It comes in four different colors – blue, green, pink, and red thus giving you an option to go for the one that works best for you. The baby activity center is easy to assemble and the process may be completed in a few minutes. This activity center designed for babies weighing up to 25 pounds. The baby activity center sports different fun and interactive toys with integrated music and light that are activated as your little one plays. All this will have a positive impact on the mental development of your baby. The activity center also helps he/she to perform sufficient exercise that will enhance the rapid development of his legs and neck. It’s a 3 in 1 convertible product, it’s designed in a way that caters to the needs of your baby as he grows. The activity center can be converted from a rocker into a walker and also to a stationary activity center. Also, the height position of the product can be adjusted as your baby grows. The top quality and durable plastic say you will be using this product for a long period of time or even for multiple babies. The Delta Children Lil Playstation ships with a toy tray that can be easily unveiled. It may be useful for serving snacks to your baby. You will use this product without worries about your baby’s safety since the activity center JPMA certified. The manufacturer states that the product meets and even exceed the safety standards set by the CPSC & ASTM. This activity center offers good value for money and cheaper compared with similar products on the market. However, the product requires 2 Lithium Metal batteries to perform properly but this is not included in the package. You will probably purchase the batteries separately. Also, some users have complained the walker does not function as expected. The best baby activity center remains not recommended for newborns. The Fisher-Price Rainforest Jumperoo activity center, the last best product on our list but not the one with the least features. It’s a sturdy and top quality best baby activity center. Also, the activity center will enhance the development of your baby, significantly. The product comes with a beautiful white and green design that will seamlessly blend into your home decor while adding style to it. Intrestinglingly, this baby activity center comes with an integrated elastic bands jumper that bounces your little one up and down for additional fun. Apart from that, the product comes with lots of fun light, music and toys to keep your baby occupied while also providing him with an unbeatable experience. The toys that ship with this activity center includes a swinging monkey and a bobbling elephant both of which are eye-catching and will leave your baby amazed for a long time and will love to bounce on it. Furthermore, the baby activity center is foldable and with a weight of about 18 pounds, one may safely conclude that you will not have issues carrying the rainforest from one place to another. Storage will also not be a problem since it has a dimension of 37 x 32 x 32 inches. This activity center can be easily assembled, easily maintained and also certified frustration-free.The rainforest features two leaves that extend from the frame of the activity center to create a canopy like an appearance. However, it’s important to state that you will probably purchase 3 AA batteries separately for the best experience from the activity center. Some users have complained that the fabric used in making the seat is not durable. Others state the activity center is more expensive compared to similar products on the market.